People wait in line at a job fair in the Queens borough of New York City. Photo by Spencer Platt/Getty Images. So what happened in April? During the month, U-7 stands rose so that 26.72 million of our fellow Americans — 16.62 percent of the workforce — is now un- or underemployed. That’s up from 26.6 million and 16.55 percent last month. Now comes the usual caution: month-to-month fluctuations should be taken with a mine of salt — or at least a Lot’s-wife’s-worth — since they come from a statistical sample. But after dropping for six months in a row, the rise in U-7, though small, is at the very least a somewhat disturbing omen. There’s some support for this in the numbers. Sixty-five thousand more Americans said they “currently want a job” (but don’t have one) than last month. Worse still, according to the BLS, is that 160,000 fewer Americans were working in April than in March when the data are “seasonally adjusted,” though such adjustments can be controversial. (The raw numbers show more Americans employed.) But if you believe the seasonally adjusted numbers, they conflict with the so-called “establishment survey” of businesses, which reported an increase of 115,000 jobs in April. Go figure. But enough with the math. What are the takeaways from this month? A puzzle. Anemic job growth, although still “growth,” according to businesses and upward revisions of job growth for the past two month — always a good thing. But fewer Americans reporting that they worked and a shrinking of the labor force, which isn’t good. And a rise in U-7, which isn’t good at all. 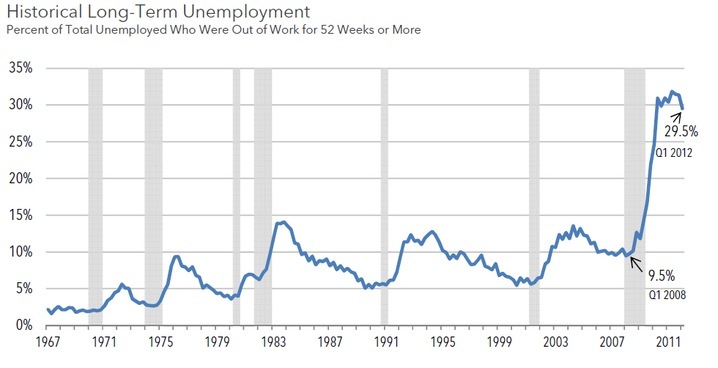 One final cause for concern: the long-term unemployed. 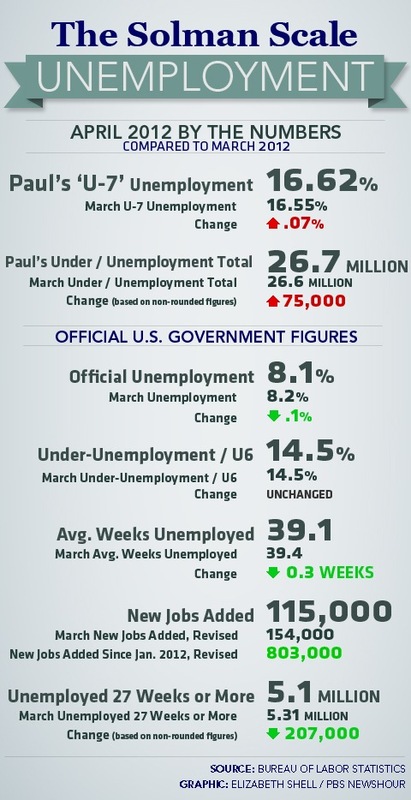 Their numbers held steady at 5.1 million in April, more than 40 percent of the total unemployed. That’s a remarkably high total. To put in perspective, a chart from the Pew Fiscal Analysis Initiative. Click for larger view. Source: Pew analysis of Bureau of Labor Statistics and National Bureau of Economic Research data. Note: Data are not seasonally adjusted. Data are shown by quarter. National Bureau of Economic Research recessions are shaded. You just don’t see pictures like this very often over periods of nearly half a century. What explains it? A hard and huge core of workers whose work skills are suddenly obsolete? The Baby Boom Bulge that’s reaching retirement age, but whose members don’t want to — or can’t afford to — retire, but don’t want to — or can’t afford to — take the lower wages that the marketplace is now offering? Is age discrimination a big part of the picture, as Baby Boomers try to hang on but no one wants them? Is unemployment insurance allowing people to remain unemployed longer? All of the above? Whatever the reasons, it’s a more graphic depiction of long-term unemployment than I’ve ever seen before. And I’ve been reporting on the people they chart for almost as far backwards as the data extend. “In the first quarter of 2008, the people who had been jobless for a year or more was about 9.5 percent of the unemployed. Today it’s about triple that, at 29.5 percent,” Ingrid Schroeder, director of the Pew Fiscal Analysis Initiative, told us. (Note that Schroeder is talking about people who have been truly long-term unemployed — out of work for an entire 12 months — unlike the BLS which calls long term unemployment those who have been out for only six months or more) “That translates to about 3.9 million people, or more than the total population of Oregon,” she added. We’ve added 1.8 million private sector jobs in the last year & brought the unempt rate down almost a point. This is an economy recovering. My conclusion on the jobs report: More meh than bleh. Yet again. Not the strength you might hope for; not the weakness you might fear.